5 Quirky Ways to Discover Madrid. Exactly a year ago, I was packing my bags for a solo trip to Madrid and Valencia. I travelled back in time to revel in the medieval era festivities of the Las Fallas in Valencia, which I wrote about in a story recently published in The Hindu. 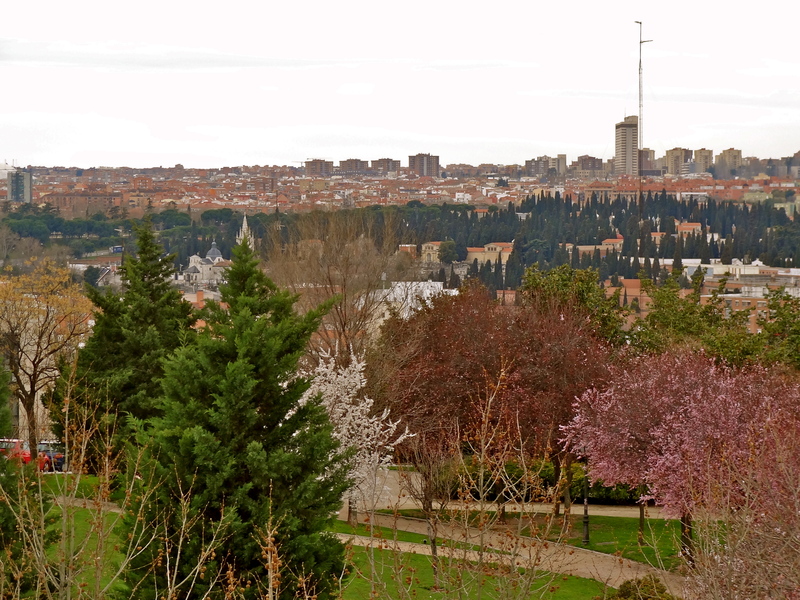 And I fell in love, almost instantly, with the vibrant colors of spring in Madrid. I strolled along quaint neighborhoods and tree-lined boulevards, and stumbled upon some of the city’s quirkiest secrets to discover why it inspired the likes of Ernest Hemingway. If you’re going to Madrid, take my list, and let the city charm you, as it charmed me. 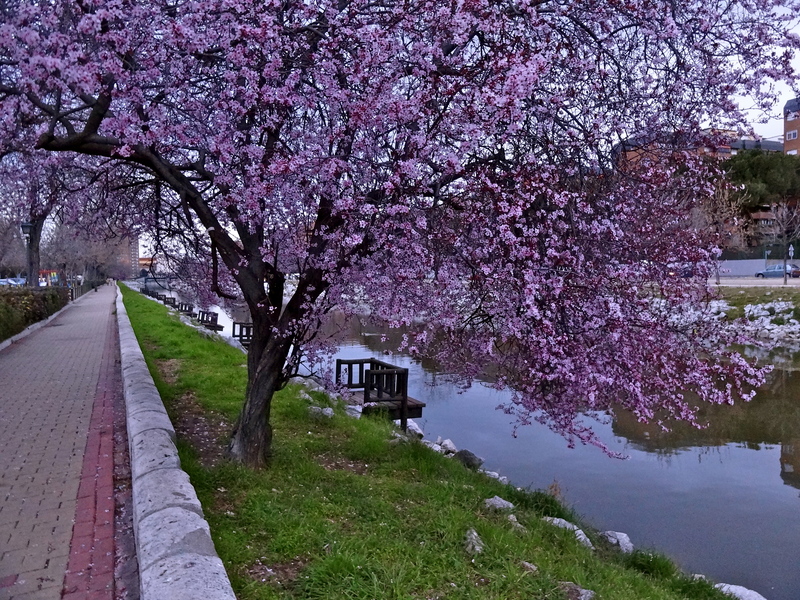 Stroll along the Manzanares river, under the cherry blossoms. Spring by the Madrid River. I expected to find medieval architecture co-existing with a cosmopolitan vibe in Madrid. But its tree-lined walkways, gorgeous parks, and natural colors of spring caught me by surprise. Thus began my quest to traverse through the most scenic parts of the city, and when I saw a map showing the River Manzanares flowing through Madrid, I decided to journey to the far end. As I alighted at the Principe Pio station, the laid-back vibe of this vintage neighborhood struck me at once. A flight of stairs below, the river flowed, surrounded by cherry blossoms, cobbled paths, and small fishing decks. I sat by the river and read, till an elderly Spanish man sat beside me; we broke into conversation and strolled along the length of the river, swapping life stories as the sun slowly set along our path. Browse through time at an antique books market. The romance of old books in Madrid. It is easy to ignore the side streets when you stroll along Paseo del Prado, one of Madrid’s richest boulevards in history and architecture. Luckily, I got lured, first by a street parade in solidarity for Slovenia and then by cherry blossoms in the distance. As I was taking a picture, a light drizzle descended, and I ran for the nearest shelter. This shelter ran parallel to rows of desks lined with books, and had the faint aroma of ancient, worn-out books. 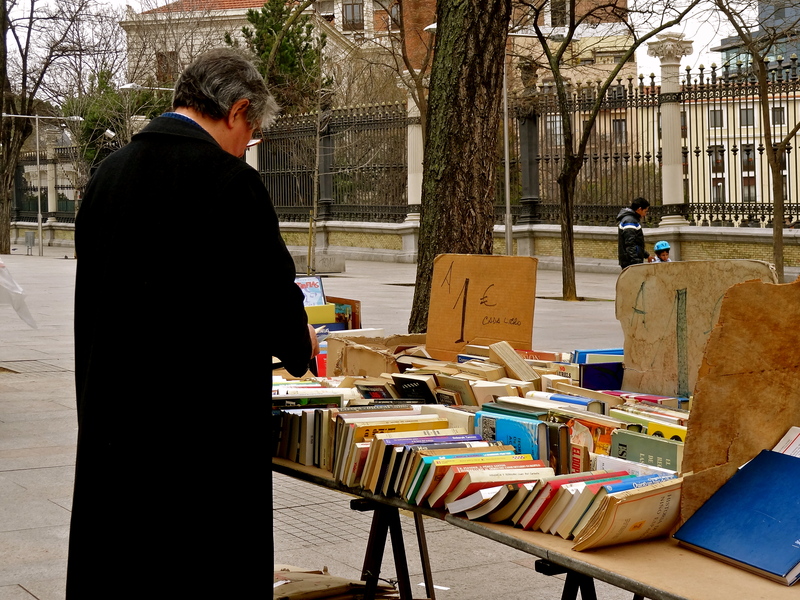 The road had led me to an antique books market in the middle of Madrid city, and I spent a lazy afternoon browsing through hardbound Spanish books, layered as much in the stories of their readers as their authors. Grab a drink at a neighborhood taquería. 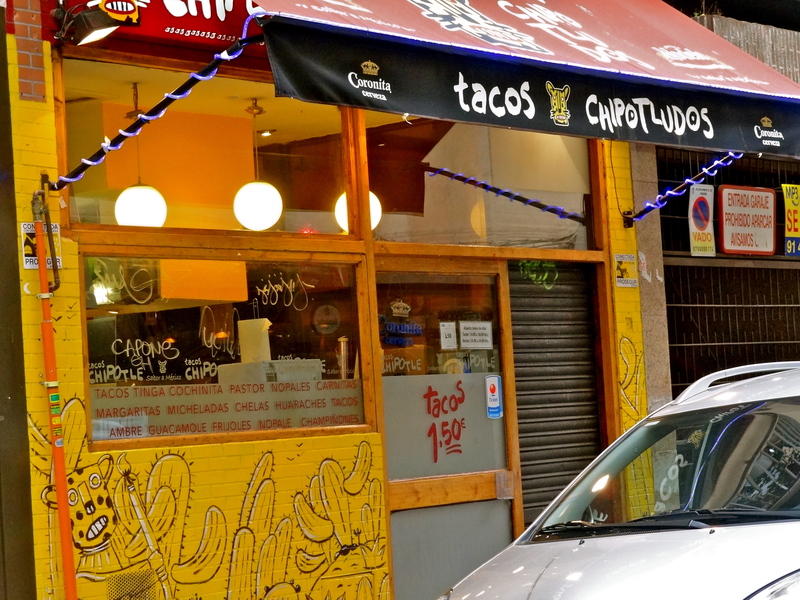 Everyone thinks Spain = Tapas bars, but while strolling along the quaint neighborhoods of Madrid on lazy afternoons, I found myself drawn in by quirky little Taquería aka Taco bars. I whiled away hours sitting at the bar, munching on finger-licking good veggie tacos, giving myself a brain freeze with frozen Margaritas, and chatting with friendly (and mostly good looking) Latino bartenders. Neighborhood taquerías are the only thing I’m willing to trade my afternoon siestas for! Rekindle your love affair at Dalieda de San Francisco. Not all those who wander are lost. But I remember feeling very lost when I took a side street to reach a park I wanted to see, and never ended up finding it. I wound along quaint neighborhoods, observing life in the city. And when I finally found someone to ask for directions in my broken Spanish, it turned out that I was closer to another park – Parque de la Dalieda de San Francisco, of which I have found nothing online except on Madripedia (yes, they have a wikipedia for Madrid)! I was in for a stunning treat, for its grassy landscapes overlooked an ancient basilica, old cemeteries, and the nondescript western suburbs of Madrid. Lose yourself in an alternative neighborhood. Malasana. Photo by Felipe Gabaldon. 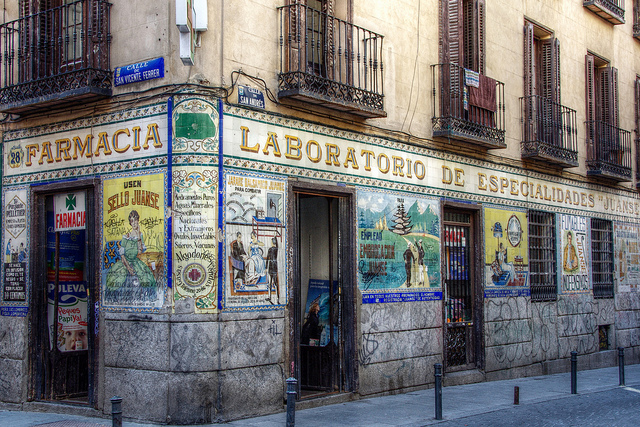 Every neighborhood in Madrid has a story to tell, but there isn’t anything quite like Malasaña. Even when I just stepped out of the Tribunal metro station, I knew this bohemian neighborhood was different. No longer were there men and women dressed in chic clothing, exuding the typically European vibe common in most big European cities. These were hipsters, quirkily dressed, with an outright don’t give a damn attitude. And so was the neighborhood, full of eccentric graffiti, funky stores, and colorful neighborhood cafes. In a way, this neighborhood’s spirit encapsulates Madrid, the city that inspires. Have you travelled in Madrid? What do you think are the best ways to discover the city? Note: My trip to Spain was made possible by the Tourism Office of Spain. Opinions here are always my own. Join The Shooting Star on Facebook, Twitter and Instagram for more offbeat travel ideas. Loved to see Madrid through your eyes, Shivya. Beautiful post. Looks beautiful. I’m definitely all for a bit of bad map-reading. I’ve discovered some great places when I’ve taken wrong turnings, or got off the bus at the wrong stop. I saw my first possum in Melbourne because I took the wrong tram to get home. I’m glad you discovered such a beautiful area. Oh wow, Melbourne’s a good place to get lost then! To think of it, most adventures are indeed born out of bad map-reading. Cheers to us 😉 Hope you make it to Madrid soon! As usual, a lovely post! Madrid is charming and I am eager to visit it now. Loved the cherry blossom picture! Getting lost in a new city is one of the best (but maybe frustrating at the time haha) parts of travel! Madrid sounds wonderful – I hope to make it there someday. I have been to Madrid several times and am currently here. It is the most beautiful city I have been in! You can never take a wrong turn in Madrid because there is something beautiful and interesting on every street! Spaniards have the most bold and kind personalities. It doesn’t matter where or what time it is, there is always someone around to have a pleasant conversation with. Meeting people in Madrid should not be planned and the best way to experience Madrid is without a map. Maybe walk around the city for a couple days with a map, but after that, you’ll be able to truly enjoy the city and not look so much like a lost tourist. It is impossible for me to get lost after all the times I’ve been here, but I do discover someplace new each time. I am currently living in a neighborhood called Delicias, that is about 25 minutes from the center. As I went on my first run of the trip, I discovered a park with jaw-dropping views and challenging (but rewarding) paths to run along. I’ve since found out that the park is named Parque Tierno Galvan. It is connected to Delicias park and also about a 20 minute run away from the Rio Manzanares (another beautiful place to run). It is highly recommended to those who live for pretty views and good quality locations to run. As for a bar and tapas, El Tigre has great Sangria and with each drink you order, they give you a plate of food. A drink costs less than 5 Euros and the food is practically free and delicious. If you go with a group, they give you many plates of food to share and sometimes keep the food coming. The environment is lively with mostly tourists there, but you still experience the Spanish culture. La Latina is a great neighborhood for antique shopping and older architecture. Every Sunday in La Latina, there is a market called El Rastro. It is a market that takes up many streets with stands selling things from antiques, to CDs, to house appliances, all at good prices. It is unique in a way that you get to shop, while also experiencing a neighborhood street by street. You’ll notice graffiti you normally would not have noticed; if you go early enough, you can catch the sun come up and illuminate the streets and make the antiques glisten. You’ll also notice it won’t even be 12 pm yet and there will already be people drinking beer. 1) Grab a bite to eat with something to drink (maybe a Mahou) and sit anywhere. It could be near the flowers in Plaza De Sol, Parque El Buen Retiro, or any place you find comfortable enough to sit for a while. Just sit and take it all in. People watching can be rewarding and you also never know what you might see. Sometimes when people go on vacation, they make a huge To-Do list and don’t write “sit and enjoy the city” on it. If “sit and smell the flowers” is more of your thing, you can literally do just that at one of Madrid’s unique parks. 2) Watch the sun rise. It doesn’t matter what you do as it is rising, but witnessing it gives you and unexplainable feeling. Feeling so happy you could cry is pretty much the feeling it will give you. Number 2 may be easier to make time for if you go out at night (write that on your To-Do list) because clubs do not close until 6am. Time flies when you’re having fun, drinking and making friends, so why not take your new friends out afterwards for a stroll in the warming sun? If you’re an early bird, don’t experience it from your room. Go out for a jog or bike ride and feel the sun lighten you up inside. For once, see the streets without traffic or people and you will see a whole other side of Madrid. It is an experience you will want to share, but won’t know how to. These are all wonderful suggestions! I also like to go to the Mercados in each Barrio. So far Mercado de San Fernando in Lavapies is my favorite! Previous PostTravel Contest: Win a Trip to New York! Next PostWhat a WWII Polish Refugee Taught me About “Hindustan”.